Kate Middleton To Give Birth In Berkshire? Kate Middleton may break with tradition and give birth to her first child at a hospital near her family home in Berkshire, and not in London, it is being reported. Insiders say the Duchess of Cambridge is considering the move, after it was revealed she’ll spend the first six weeks after the birth at her parents’ Bucklebury home. 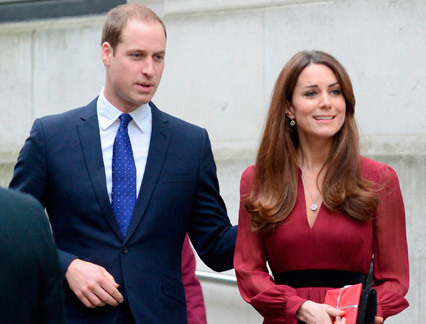 KATE MIDDLETON AND PRINCE WILLIAM’S ANNIVERSARY CELEBRATIONS REVEALED! A source told the Telegraph Kate Middleton’s family are very much in support of the idea, and are encouraging her to choose the Royal Berkshire Hospital, where her sister Pippa was born. ‘Kate’s family want the baby to be born at the Royal Berkshire Hospital,’ a family friend told the paper. It’s thought Kate’s surgeon-gynaecologist Alan Farthing, who also looks after the Queen, will travel to whichever hospital the royal couple choose. This comes after it was revealed Kate Middleton will spend at least the first six weeks after the birth of her first child away from the spotlight, at her parents’ home, before returning to London. And there will certainly be plenty of room. Last year,Michael and Carole Middletonbought a sprawling £4.85 million seven-bedroom property near their previous home in Bucklebury, Berkshire. It’s thought the Georgian manor comes with 18 acres of land, and ‘fantastic views’. A royal spokesman said an announcement about where Kate Middleton plans to give birth will be made ‘in due course’.